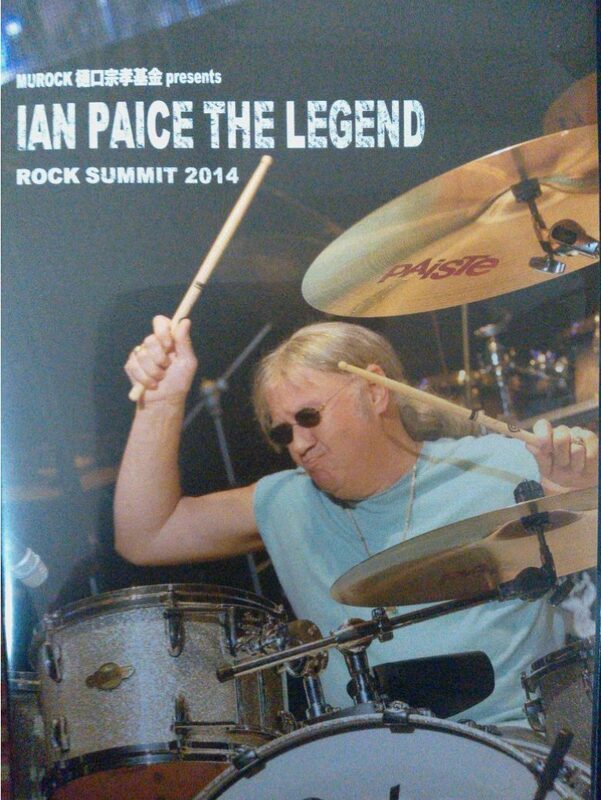 Ian appeared as a special guest in an event titled “Tribute to the artists fighting cancer ROCK SUMMIT 2014 featuring IAN PAICE (Deep Purple)”, on November 29. It was sponsored by the Higuchi Munetaka Foundation. Higuchi Munetaka is the rock drummer of a Japanese heavy metal band called Loudness. Munetaka passed away in 2008 at the age of 49 due to cancer. In this event, Ian led the orchestration of 10 drummers who appeared on stage with him. They also played some Loudness songs, and of course Deep Purple tunes, although the Deep Purple songs are not included in the DVD. 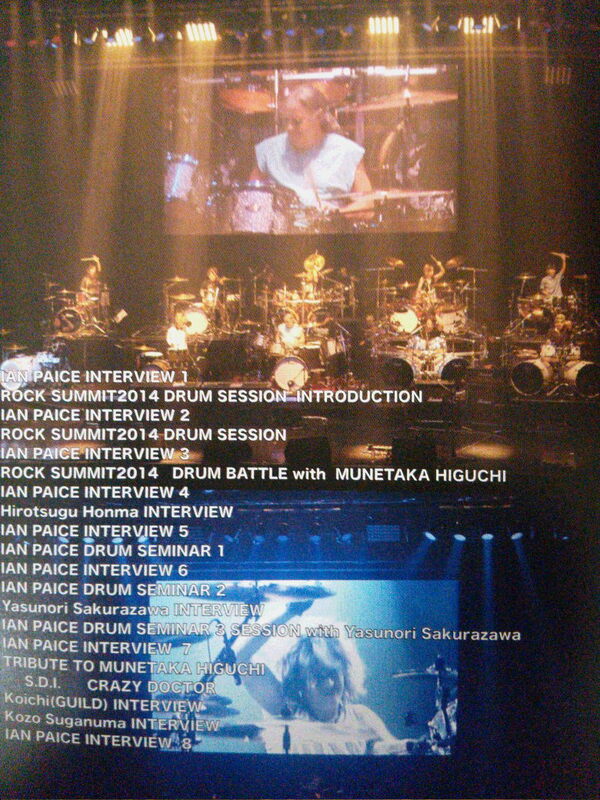 On November 30 and December 1, Ian conducted a drum clinic sponsored by Pearl in Tokyo and Osaka. 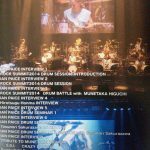 The DVD is a collection of the performance at the Rock Summit event, Ian’s interview, the other drummers’ comments on Ian’s drumming and his great personality, Ian’s performances at the drum clinic (a lot of wonderful drumming!) and clips of Q&A sessions from the clinic. I especially enjoyed his comment on how Burn was created. He said that while working on the verse, the band came to a halt at the same place for many hours. He got bored and spontaneously started a drum solo at the place where they got stuck. The other band members said “That’s it!” And so it came to be. The other drummers’ comments on how Ian is very down-to-earth, and how he really seems to enjoy drumming even now, was very nice to hear as well! Thanks to Akemi Ono for the info and pictures. Posted by Nick Soveiko on Monday, May 30th, 2016, filed under News. You can follow comment on this post through the RSS 2.0 feed. You can skip to the end and leave a comment. Pinging is currently not allowed. 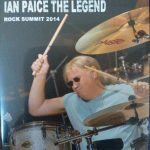 – Ian Paice is the greatest rockdrummer of all time! 1. Come Taste The Band. 3. The Book of The Taluesyn. No other rockdrummer has ever played more varied than on these 3 records. I think it was Roger Glover that once suggested that a legend is just a foot (leg-end). Lol!. What can I say?, I love Ian Paice’s drumming & he’s a decent chap as well. He da best!. Be happy.